How to treat ED and sexless marriage. Erectile dysfunction treatment in Dallas. Erectile dysfunction at 18.
told by the people who lived it. Interactions with the Afrikaners were always antagonistic before we went to prison. But in Robben Island we came to understand the character of the Afrikaner as a political animal. NEVILLE ALEXANDERAs one of the founders of the National Liberation Front, Neville Alexander was convicted in 1964 for conspiracy to commit sabotage and sent to Robben Island for ten years. After his release, Alexander became involved in the fight against P.W. Botha's tricameral constitution and in 1979 wrote a book called One Azania, One Nation. In prison you have time to think about the things that matter, like the future of the country. In spirit. you are actually freer than the people outside. When I was released I was uneasy. I felt I was better off with the crowd on the Island. That carried on for a while. FIKILE BAMWhile studying law at the University of Cape Town, Fikile Bam became an underground activist, distributing propaganda. He spent 11 years on Robben Island with Nelson Mandela before being released in 1974. GEORGE BIZOSGeorge Bizos, a Greek expatriot and veteran lawyer, defended many well-known political activists in South Africa beginning in 1954. Bizos was Nelson Mandela's lawyer and confidant throughout the Rivonia Trials, and he defended Winnie Mandela several times in court. Throughout the 1990s, Bizos played a central role in establishing constitutional law and investiged apartheid-era crimes for the Truth and Reconciliation Commission (TRC). PIK BOTHAPik Botha became a member of the South African Department of Foreign Affairs as a young man. He joined the National Party in 1970, and sat in the UN General Assembly during the height of apartheid. Botha served under Nelson Mandela as Minister of Energy, but left in opposition to F.W. de Klerk's departure from office. CHRISTO BRANDAs a young warder on Robben Island, Christo Brand became friendly with many of the political prisoners. Later in his career, Brand was transferred to Pollsmoor Prison where he eventually took Nelson Mandela on several preparatory outings prior to his release. NAT BREGMANNat Bregman was a law clerk at Witkin, Sidelsky, and Eidelman at the same time as Nelson Mandela, in 1942. Mandela refers to Bregman as his first white friend. As a member of the South African Communist Party he introduced the future leader to the intellectual ideals of Communism. We used to get together in somebody's home, Nelson, Yusef, Walter, and others. There was the home of a family very near to Indian Congress and also near to the ANC offices in the centre of Johannesburg. A lot of people in the offices used to go over to their home for meals. It was social life but spiced with political ideas always. AMINA CACHALIAAmina Cachalia was a prominent member of the Indian Youth Congress during apartheid. She comes from a political family whose involvement began with Mahatma Gandhi's passive resistance movement in South Africa. Cachalia's political activities brought her into contact with Nelson Mandela, who later became a close friend and mentor. EDDIE DANIELSEddie Daniels formed the African Resistance Movement in partnership with dissenting liberals in order to exert greater pressure on the apartheid government. He was sentenced to 15 years imprisonment on Robben Island for committing acts of sabotage. Daniels entered Robben Island with an 8th grade education and left with two university degrees. We were amateurs trying to do our best to destroy apartheid. We were not highly trained. We paid to fight. Even supplied our own cars. Ten percent of our salaries went to the fight. DENIS GOLDBERGDenis Goldberg was the only white member of Umkonto we Sizwe (MK) to be arrested and sentenced in the Rivonia Trials to life imprisonment. He was sent to a white prison in Pretoria to serve a life sentence for 'attempt to overthrow the apartheid state through force of arms'. Being black and involved (in the struggle) meant you had support of many people and it meant you got to be part of a community. Being white and involved meant being isolated. RITA HODGSONRita Hodgson and her husband, Jack, were anti-apartheid activists when Nelson Mandela was gathering support for an armed struggle. Having spent time in the military and the mines near Johannesburg, Jack was an explosives expert. Nelson Mandela and others carried out early bomb experiments at the Hodgson's house in preparation for the launch of Umkonto we Sizwe (MK) and the bombing campaign, which began on December 16, 1961. The couple fled into exile shortly thereafter and remained active in the underground from Southern Africa. AHMED KATHRADAAhmed Kathrada was sentenced to life imprisonment at Rivonia along with the core leadership of Umkonto we Sizwe (MK). He began a political career in his teens as a member of the Transvaal Indian Youth Congress. He completed his BA in Arts and an Honors in History and Politics while on Robben Island. Kathrada served as a Parliamentary Counselor to Mandela after the 1994 elections. It's been ingrained in us, this apartheid thing. We were excluded from all these facilities: restaurants, hotels...and now they're all open to us. I can't speak for the others, but it's that easy to adjust. TOM LODGETom Lodge is a well-known political scientist in South Africa. 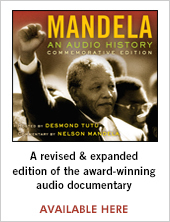 He has written several comprehensive analyses on apartheid, including Consolidating Democracy: South Africa's Second Popular Election and Politics in South Africa from Mandela. MAC MAHARAJMac Maharaj became politically active in 1963. He spent several years underground as part of Umkonto we Sizwe (MK), the armed wing of the African National Congress (ANC). During his 12 years on Robben Island, Maharaj transcribed, in miniscule handwriting, thousands of pages of Mandela's notes. The papers he smuggled out with him upon his release became the basis for Mandela's memoir, Long Walk to Freedom. Maharaj was part of the team that negotiated the transitional government in the early 1990s. MAKAZIWE MANDELAMakaziwe (Makie) Mandela is the youngest daughter of Nelson Mandela and his first wife, Evelyn. She was 6 years old when her parents divorced. Makie frequently visited her father while he was underground in the 1960s, and didn't see him again until she was a teenager in the late 1970s. NELSON MANDELANelson Mandela was the iconic leader and worldwide symbol of forgiveness and the triumph of the human spirit in the struggle for freedom. Having spent 27 years as a political prisoner on Robben Island, he was instrumental in helping to negotiate an end to apartheid. Mandela was president of South Africa from 1994 until 1999, when he retired from public service. WINNIE MADIKIZELA-MANDELAWinnie Madikizela-Mandela was Nelson Mandela's wife and political partner for nearly 38 years. Madikizela-Mandela was regularly banned for her political activities; in 1975, she was banished to the small Afrikaaner town of Brandfort in the Orange Free State. In the late 1980s, she became a controversial figure because of her involvement with the Mandela United Football Club, which brutalized her neighbors and kidnapped 14-year-old Stompie Stompei. Madikizela-Mandela has been president of the ANC Women's League and was deputy minister of arts, culture, science, and technology for the ANC from 1994-1995. ZINDZI MANDELA-HLONGWANEZindziswa (Zindzi) Mandela-Hlongwane is the youngest daughter of Nelson and Winnie Mandela. She was 18 months old when her father was sent to prison, and she was 14 when she first saw him again on Robben Island. In 1985, Zindzi made headlines when she read aloud her father's response to the government's conditional release offer. The speech, known as "My Father Says..." in which he emphatically refused the offer, inspired a renewed mass action campaign. I delivered that message at Jabulani Stadium, in Soweto. My mother was banned at the time, so she couldn't attend. But she did come disguised. I was a bit emotional, close to tears, because it was my father's words. It was hard: here was an opportunity when he could have come out. I could have had a normal life, but once more I couldn't. And I couldn't even fault him for that, because I believed in the stand that he took. DOROTHY MASUKAAt the age of 14, Dorothy Masuka became famous in South Africa for her political songs including Dr. Malan, which despite being banned, was known by almost every black in the country. After a very brief career, she went into exile where she was active in the underground struggle. She returned nearly four decades later to sing at Nelson Mandela's inauguration. JOE MATTHEWSJoe Matthews was active in the African National Congress (ANC) and the Youth League since 1944. Matthews accompanied Nelson Mandela on his trans-Africa tour to garner support and training for the military branch of the ANC. Matthews was a close friend of Mandela, often staying with him in his Soweto home after Mandela and Winnie divorced. FATIMA MEERFatima Meer was an author, professor of sociology, and political activist. Meer and her husband were good friends with Nelson Mandela in the 1950s, but she became even closer to Winnie when they were imprisoned together in 1969. Meer was the first president of the Black Women's Federation (established in 1975) and author of the Nelson Mandela biography, Higher Than Hope. ROELF MEYERRoelf Meyer was one of the key architects of the post-apartheid constitution. He and ANC negotiator Cyril Ramaphosa were known as 'the channel', the only line of communication throughout the official and unofficial breakdowns in the negotiation process. Meyer was Minister of Provincial Affairs and Constitutional Development for the transitional government until 1997, when he resigned and helped pioneer a new political party, the United Democratic Front (UDF). BONGHI MKHABELASibongiwe (Bongi) Mkhabela was one of the student organizers responsible for planning the Soweto march to protest the use of Afrikaans as a language of instruction in high schools. She was arrested shortly after the June 16th march, where police shot at student protestors, killing 60 and wounding hundreds more. She was sent to Pretoria Maximum Prison for seven years; much of that time was spent in isolation. ANDREW MLANGENIAndrew Mlangeni was sentenced to life imprisonment in the Rivonia Trials and spent 26 years on Robben Island with Nelson Mandela and others. He was one of the few leaders who were transferred to Pollsmoor Prison with Mandela in the 1980s. He received his BA in Political Science through University of South Africa while in prison. Mlangeni became a member of Parliament after the 1994 elections. THANDI MODISEAs a teenager, Thandi Modise crossed the borders into Angola to train as a guerilla soldier for the emerging military wing of the ANC, Umkonto we Sizwe (MK). Having undergone military and political training, she was the first woman sent back to fight and organize in the townships. Her fellow soldiers named a machine gun "The Thandi" in her honor. Modise has recently served prominent roles in the ANC, the Women's League, and Parliament. STRINI MOODLEYStrini Moodley was a key founder of the Black Consciousness movement and the South African Students Organization (SASO). He was arrested in 1974 under the Suppression of Communism Act and sent to Robben Island, where he inhabited a cell across the hall from Nelson Mandela. After Moodley was released from prison, he worked as a journalist for the Natal Witness and served as a member of the National Executive Committee of Media Workers Association. DULLAH OMARDullah Omar was one of the few lawyers allowed to visit political prisoners on Robben Island. He would often smuggle papers in and out of the prison in food that his wife cooked for the prison guards. Omar endured intense harassment by the apartheid government. He was banned and detained several times, and the security body of the NP government made numerous attempts to assassinate him, at one point attempting to kidnap his daughter. Omar was appointed Minister of Justice under Nelson Mandela in 1994, and later as Minister of Transport under Thabo Mbeki. ALBIE SACHSAlbie Sachs was a member of the underground military and was detained under the "90 Day Law" by the apartheid regime. As the government was preparing to release Mandela, Sachs and others were studying constitutions around the world in preparation for negotiating the new South African constitution. Once negotiations began, he served a key role in the process. He later served as a justice of the Constitutional Court of South Africa. LUNGI SISULULungi Sisulu is the eldest son of Walter Sisulu, Nelson Mandela's mentor and confidant throughout the anti-apartheid struggle. Lungi began crossing borders to deliver messages for the underground at the age of 14. He and his family lived with ongoing harassment by the South African police force during apartheid. He is currently a businessman in Johannesburg. RAYMOND SUTTNERAs a white university lecturer and member of the South African Communist Party (SACP), Raymond Suttner worked underground for the guerilla movement from 1971 until his arrest in 1975. He was imprisoned for seven years and six months, and in 1986 was detained for another three years. Having helped to clarify the Freedom Charter, Suttner returned to academia where he has researched guerilla fighters in the underground struggle. LEON WESSELSFrom the 1970s on, Leon Wessels was a prominent white political activist. He initiated dialogue between the Afrikaans "Studentebond" and the predominantly black South African Students Organization. Wessels was central to the post-apartheid negotiation process and was appointed Deputy Chairman of the Constituent Assembly, which was responsible for writing a new constitution for South Africa. ERIK VAN EESErik Van Ees was a South African journalist who wrote for the foreign press. He was one of a handful of journalists who were invited to visit Robben Island in 1977. Van Ees' political reporting was limited by banning restrictions both within the country and abroad throughout the apartheid era. CONSTAND VILJOENConstand Viljoen was Chief of the South African Defense Force for 14 years during apartheid. Having been raised as an Afrikaner farmer in South Africa, he sought to protect the rights of Afrikaners in the transition to democracy. In 1993, he planned to stage a military coup against the transitional South African government, but was deterred at the last minute by Thabo Mbeki, Mandela, and others. Viljoen was involved with the constitution-writing process and was granted inclusion of self-determination for Afrikaners. STEVE BIKOSteve Biko was founder of the Black Consciousness Movement and co-founder of the South African Student Organization (SASO). Arrested twice in the late 1970s, Biko died of cerebral injuries sustained in police custody. The murder captured international headlines and established Biko as an enduring symbol of black resistance to oppression. CHRIS HANIChris Hani was chief of staff of Umkhonto we Sizwe (MK) and a senior member of the South African Communist Party (SACP). Hani received specialized military training in the Soviet Union and later fought in the Rhodesian bush war. He returned to South Africa when the ANC and SACP were unbanned in 1990. In 1993, Hani was assassinated by right-wing extremists hoping to disrupt the election. And they almost succeeded. The country teetered on the brink of chaos as thousands mourned his death. Mandela calmed the masses when he appeared on television saying, "Let us respond with dignity." P.W. BOTHAKnown as the "great crocodile", P.W. Botha joined the Nationalist Party in 1948 and served as Prime Minister from 1978 until his resignation in 1989. Although Botha was a strict conservative, many apartheid restrictions were loosened under his regime and he began secret negotiations with the then imprisoned Nelson Mandela before he was ousted by his own party. He was charged at the Truth and Reconciliation for 'Crimes of Humanity', which occurred under his watch. D.F. MALAND.F. Malan was the Prime Minister of the National Party (NP) when it first came to power in 1948. The 1948 elections represented a radical shift from British colonial rule (under Smuts and the United Party) to the Afrikaner-dominated NP which ran on a platform of racial separation. H.F. VERWOERDH.F. Verwoerd is considered to be the intellectual architect of apartheid. As Minister of Native Affairs for the NP government in his early career, he implemented some of the most effective apartheid laws including the infamous 'Bantustan' policy, which separated black tribes into independent homelands that were denied basic civil rights. Appointed Prime Minister after the death of J.G. Strijdom in 1958, Verwoerd lead South Africa through the turbulence of the 1960s. He was stabbed to death in 1966 by a Parliamentary messenger. WALTER SISULUWhile his name is not as widely known as Nelson Mandela's, Walter Sisulu played an integral role in grooming the ANC leadership in the anti-apartheid struggle. He was part of the trio that formed the ANC Youth League in 1944, he was a key figure in the Defiance Campaign of the 1950s, and he helped establish the MK in 1960. One of eight men imprisoned for life in the Rivonia Trials, Sisulu is considered by most of his comrades to have been the father of the struggle. Walter Sisulu passed away on May 5, 2003. OLIVER TAMBOOliver Tambo was the co-founder (along with Nelson Mandela) of South Africa's first black legal firm. Being a key leader (and eventually the President) of the ANC, Tambo went into exile in the 1960s and managed the external activities of the ANC. These activities included several visits to the United Nations, structural reorganization, and the establishment of military training camps outside South Africa. After suffering from a stroke in 1989, Tambo in 1991 relinquished his position as ANC president to Nelson Mandela.